One year after a WTOP Ticketbuster investigation uncovered videos questioning the accuracy of the Morningside speed camera program, Prince George's County has dealt a serious blow to the town's efforts to restart the cameras. MORNINGSIDE, Md. — One year after a WTOP Ticketbuster investigation uncovered videos questioning the accuracy of the Morningside speed camera program, Prince George’s County has dealt a serious blow to the town’s efforts to restart the cameras. Morningside and contractor Brekford terminated their relationship in May, as WTOP Ticketbuster was first to report. Sources tell WTOP that Brekford made the decision to discontinue the relationship, although neither side would officially confirm the report. Morningside is an independent municipal corporation within Prince George’s County, near Joint Base Andrews and minutes from Temple Hills, Oxon Hill and the Woodrow Wilson Bridge. Morningside Attorney Todd Pounds says the town has been in negotiations with several contractors since the summer, although he would not reveal details since no contract has been signed. But in order to execute a contract and install new speed cameras, Morningside also must legally receive authorization from Prince George’s County. Morningside applied for permission on Aug. 11, according to a letter obtained by WTOP Ticketbuster. Pounds writes that the cameras on Suitland Road would protect Skyline Elementary School, Imagine Foundation School and Benjamin D. Floulis Academy. But on Sept. 19, Prince George’s County denied permission. The Department of Public Works and Transportation owns the roadway where the camera was located. “There is neither a designated school crosswalk at or near the location of the proposed automated enforcement, nor is any school fronting Suitland Road,” writes DPW&T Director Darrell B. Mobley. “The existence of schools located within a half mile of the proposed roadway is not sufficient to establish a school zone. 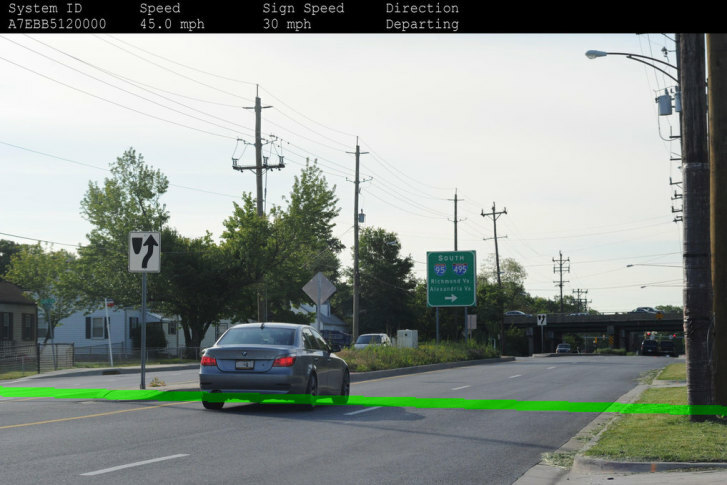 While we share and support the Town’s commitment to promoting safe driving, we do not support this request to place automated speed enforcement cameras along Suitland Road,” the letter concludes. DPW&T included a copy of the State Highway Administration guidelines about what constitutes a school zone for speed cameras. The decision might eliminate any opportunity for Morningside to restart its speed camera program. Under Maryland law, no municipal corporation can start a program without permission from Prince George’s County. “The safety of the children in the Town of Morningside is of paramount importance and we are disappointed with this preliminary decision. We will be reviewing our next course of action for the protection of our children,” Pounds tells WTOP in a statement. Morningside could sue Prince George’s County, but it would have to show that it violated Maryland law in the decision. Without permission from the county, a contractor would be unable to perform services and collect revenue. Pounds cited the previous use of the cameras twice in his letter. “Morningside has operated speed cameras along Suitland Road for many years and has found them to be very effective,” writes Pounds. In actuality, Morningside began the program under questionable circumstances. It applied for permission July 2011 to begin speed cameras. Under Maryland law, Prince George’s County must reply within 60 calendar days or the municipal corporation can automatically proceed with speed cameras. Prince George’s County denied permission to Morningside in a letter dated 57 days after the request, citing similar concerns as this latest denial. But Morningside did not receive the letter until shortly after 60 days, and it argued that the response came too late. Prince George’s County decided against pursuing the matter. For those such as Mike Weathersby and Steven Johnson, such news will come as relief. Both had received questionable tickets and decided to shoot video whenever they passed the camera. Ultimately, it was their videos with their speedometers in the background that exposed key questions about the cameras and possibly led to the downfall of the entire program.